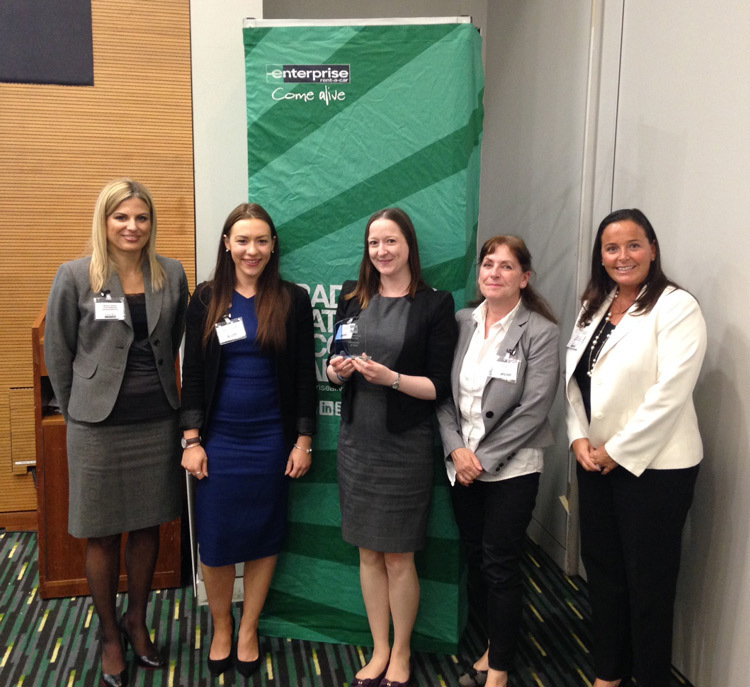 Kent Business School (KBS) were delighted to collect three awards at Enterprise Rent-a-Car’s Annual Advisors Of The Round Table Conference, which took place at the Park Inn Hotel in Heathrow earlier this month. Employability representatives from universities all across London and the South-East came together to celebrate the achievements of the past year and learn about exciting developments planned for the next year. The University of Kent and Kent Business School were awarded “Campus Brand Manager Partnership of the Year”, “Business Partner of the Year” and “Best in Class”. “Campus Brand Manager Partnership of the Year” recognised the success of the collaboration between KBS, Business and Management student Campus Brand Manager Katie Close and the Careers and Employability Service, particularly on our Medway Campus. Katie demonstrated creativity, a remarkable work ethic, and overall drive to become the no.1 Enterprise Campus Brand Manager for London and the South East. “Business Partner of the Year” was awarded to the KBS Employability and Placements Team for their hard work with Enterprise in the past year, developing the relationship and helping to cultivate a brand awareness at the University. Special mentions were made to Sophie Davis, KBS Employability and Placements Manager, who has positioned Enterprise as one of the leading employer brands on campus. “Best in Class” was awarded to the University of Kent for being one of the top universities for the number of applications for both Year in Industry placements and graduate roles (245), number of hires (28) and also with a 1st interview to hire conversion rate of 32%. Over half of these students studied with Kent Business School. Congratulations to all who contributed to achieving this, including staff and students within KBS and the Careers and Employability Service. Special thanks go to those at Enterprise Rent-a-Car for recognising these accomplishments. KBS look forward to continuing to develop this successful partnership.